A full-sized, interactive map can be viewed at Transportation Services Map. This map has many layers to view different levels of parking and resources. The Hunting Parking Map lists parking lots in blue where hunting spaces may be found throughout campus. See below for sign clarification. 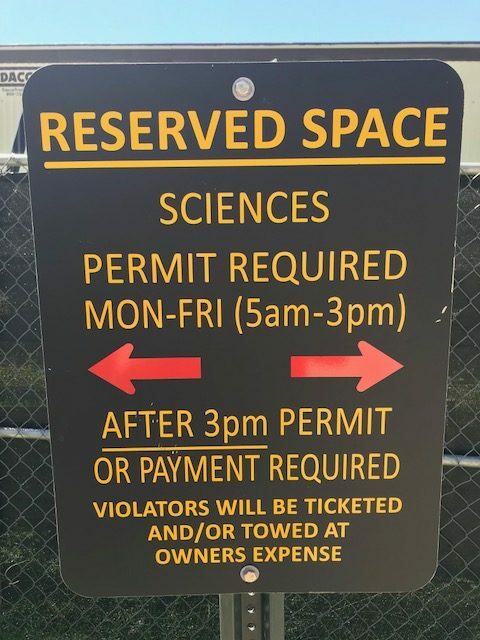 The picture above depicts the yellow signs marked “Reserved for Faculty/Staff”. These spaces are not reserved for a specific lot, and are first come/first serve. 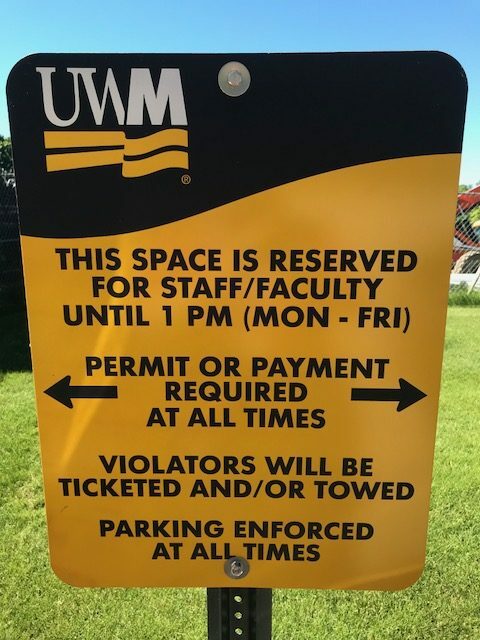 Hunting permit holders and faculty/staff paying at pay stations or Parkmobile can use these spaces as well as Grounds and Facility Services. 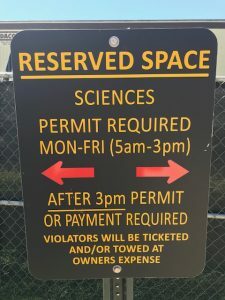 Grounds and Facility Services can also park in non-parking spaces as long they are not blocking anything important, such as handicap accessible areas, dumpsters, and walkways. After 1 pm, non-permit holders may park here as long as they have payed using a pay station or Parkmobile. The picture above depicts the black signs marked “Reserved”. Only permit holders with the lot-specific reserved permit may park in the spaces during the time frame listed. After the time indicated, anyone may park in these spaces as long as they have a Hunting permit or have paid using a pay station or Parkmobile. Unmarked spaces are available for anyone with a Hunting permit or payment via a pay station or Parkmobile. All permit holders should make sure that their license plate is associated with their account. 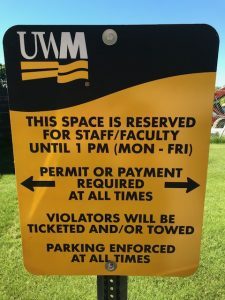 Visit uwm.edu/transportation/portallogin to manage your account, purchase permits, or pay and appeal citations.